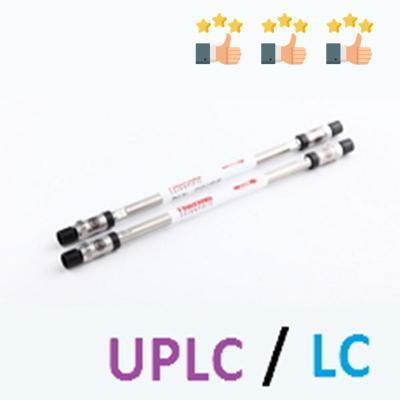 Endcapped, ultra-pure, silica-based columns with exceptional peak shape and resolution for HPLC and LC-MS. Recommended for analytes with medium hydrophobicity or when a less hydrophobic phase is required to obtain optimum retention. Lower hydrophobicity than C18 or C8 recommended for very hydrophobic analytes. Controlled interaction mechanism by which polar analytes can be retained and resolved. Introduction of a fluorine group into the stationary phase causes significant changes in solute-stationary phase interaction. Contains a C4 linker which allows for superior alignment of the phenyl ring with aromatic molecules. For both normal phase and reversed-phase separations. A high performance aminopropyl phase that gives excellent chromatographic properties in three modes: weak anion exchange, reversed-phase and normal phase. A highly stable quaternary amine strong anion exchange column for aqueous and low pH mobile phases. Unbonded, highly pure base deactivated silica media that is the backbone of the Hypersil GOLD range of columns. Retains and separates polar analytes that are problematic using reversed-phase columns.